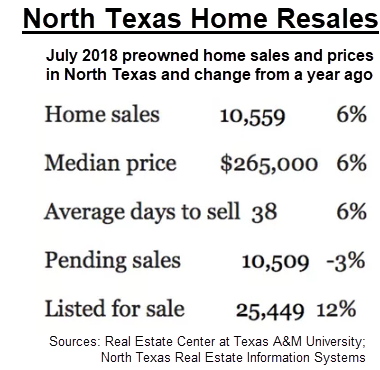 ​​​​​ DALLAS-FORT WORTH – North Texas home sales bounced back in July 2018 with a 6 percent gain from a year earlier after a decline in June. Real estate agents sold 10,559 preowned single-family homes last month, according to a report from the Real Estate Center at Texas A&M University and the North Texas Real Estate Information Systems. The median home sales price was ​$265,000, 6 percent more than July 2017. In the first seven months of 2018, r​eal estate agents sold 62,550 single-family homes—2 percent more than in the same period last year. In addition, the number of North Texas homes for sale rose to 25,449, which is the highest inventory since 2012. Nearly three months worth of homes were for sale in July 2018, an increase from the less than two-month inventory at the beginning of the year. Housing analysts are predicting slower home sales and price growth in 2018 after years of booming residential activity in North Texas. ​Check out Dallas-Fort Worth-Arlington Housing Market Research.